Skullcandy Ink'd Earbuds. Made with silicone earbuds. with Microphone and Remote - Red. 11mm drivers with neodymium magnets for full-range sound. Two sizes of silicone gel earbud sleeves for a perfect fit. In-ear design allows for passive noise isolation. New BULK Skullcandy 3.5mm Black Earphones Earbuds Headset For Phones With Mic. Driver: 11 mm. Connectivity Technology: Wired. Skullcandy Ink'd 2 In-Ear Headphones. 11mm drivers with neodymium magnets for full-range sound. w/Mic Remote - (Gray/Cyan/Gray) NEW. In-ear design allows for passive noise isolation. Two sizes of silicone gel earbud sleeves for a perfect fit. Trending at $7.29eBay determines this price through a machine learned model of the product's sale prices within the last 90 days. Skullcandy INK'D Wireless Bluetooth® In-Ear Headphones with Microphone. 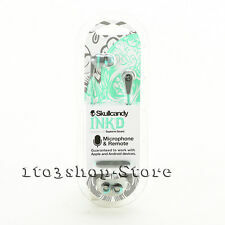 Skullcandy Ink'd 2 Riot In-Ear Earbuds Headphones w/Mic Remote (Explorer/Forest/Green). 11mm drivers with neodymium magnets for full-range sound. Let's Get on the Party Ride. Two sizes of silicone gel earbud sleeves for a perfect fit. Color : Rasta. 1.3M Cable. Our hard-working staff are professional, experienced, and dedicated to making your buying experience as pleasant as possible. 16 Ohms Impedance. Compatible with iPhone and does have in-line Microphone. Their 10mm drivers utilize neodymium magnets and produce a wide frequency response of 20 Hz to 20 kHz. 1 Skullcandy Ink'd Wireless headset. Bluetooth Headset Benefits Universal Compatibility: Works with all Bluetooth enabled cell phones by all manufacturers.